1. The customer orders by telephone, fax, letter, e-mail or online at www.meissen.com. The customer receives a written order confirmation. The customer chooses the shipping method of the order confirmation. Goods shall only be delivered in quantities customary in households. 2. The contract is only concluded by the submission of the declaration of acceptance by MEISSEN . MEISSEN is entitled, but not obliged, to accept the contract offer of the customer within 14 days after receipt by MEISSEN . MEISSEN declares its acceptance by an order confirmation sent either by fax, letter or e-mail. 1. The collection, storage and use of personal data is necessary for the processing of orders. MEISSEN collects personal data only as far as these are communicated within the scope of ordering goods, opening a customer account, within the scope of the customer dialogue or registering for the MEISSEN newsletter and only to the extent absolutely necessary for the respective use. 2. To process the order MEISSEN stores the address details and any data required for individual payment methods. The data provided will be used without separate consent exclusively for the fulfilment and processing of the order. 4. The customer can object to the use of his personal data for advertising purposes at any time. Objections must be sent to the above contact address. 1. 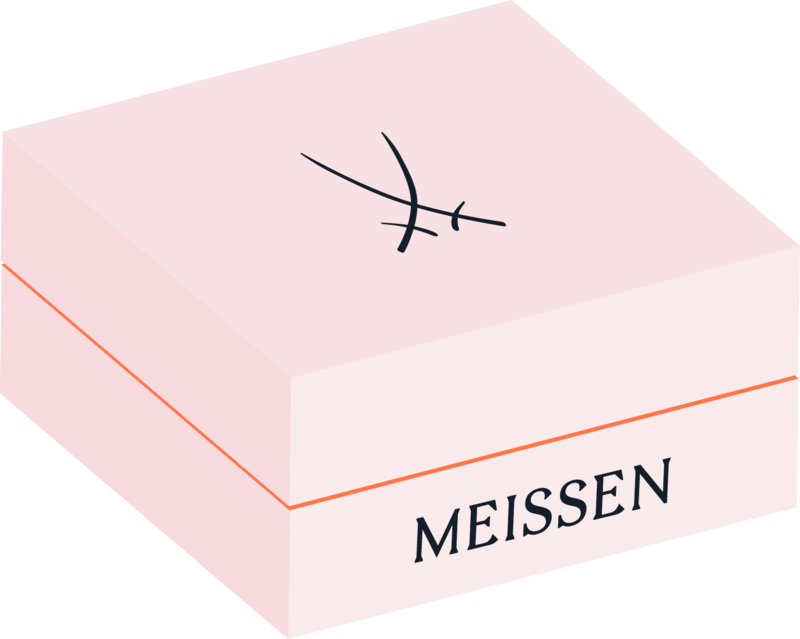 If MEISSEN is unable to comply with the stated delivery times due to force majeure or for other reasons for which it is not responsible, MEISSEN will inform the customer of this immediately. At the same time MEISSEN determines a new delivery period appropriate to the respective circumstances. If the goods are also not available within the new delivery times for reasons for which MEISSEN is not responsible, MEISSEN may withdraw from the contract in whole or in part. MEISSEN will immediately reimburse the customer for any payments already rendered. If the customer cannot reasonably be expected to accept the delivery due to the delay, he can withdraw from the contract by immediate declaration in text form (i.e. in writing, by fax or e-mail) to MEISSEN . Further legal rights of the customer remain unaffected. 2. Partial deliveries and premature deliveries are permissible within the scope of what is reasonable for the customer. If the customer has ordered several articles, it can happen that MEISSEN sends these in several deliveries. MEISSEN will inform the customer about this before the shipment. 3. Delivery and/or dispatch to embargo countries and/or to legal and natural persons affected by international sanctions is excluded. Shipping costs are shown separately in the invoice. Jewellery worth EUR 1,000.00 or more is shipped by DHL ValuePack and is therefore always an express shipment. Shipping to addresses outside the European Union is preferably via DHL Express or FedEx; the costs are shown separately. 1. Payment can be made by credit card, PayPal, PayPal Plus, Immediately at Klarna, Giropay or for customers with a German bank account by direct debit (SEPA basic direct debit). In addition, registered customers have the possibility to purchase on account after an appropriate credit check. 2. MEISSEN is entitled to withdraw completely or partially from all existing contracts for which the customer has not yet paid the purchase price despite due date and reminder. 1. The delivered goods remain the property of MEISSEN until the purchase price has been paid in full. 2. In the event of seizure of the goods or other interventions by a third party, the customer is obliged to inform MEISSEN immediately in writing and to inform the third party of MEISSEN’s retention of title. You have the right to withdraw from this contract within 14 days without giving reasons. You have the right to withdraw from this contract within 14 days without giving reasons. The withdrawal period is 14 days from the day on which you or a third party designated by you, other than the carrier, have taken or have taken possession of the last partial consignment or the last item. of your decision to withdraw from this agreement by means of a clear statement (e.g. a letter sent by post, fax or e-mail). You can use the attached model withdrawal form, which is not mandatory. If you make use of this option, we will immediately (for example by e-mail) send you a confirmation of receipt of such a withdrawal. In order to comply with the withdrawal period, it is sufficient that you send the notification of the exercise of the right of withdrawal before the expiry of the withdrawal period. Please find the withdrawal form here. If you withdraw this agreement, we will refund to you all payments we have received from you, including delivery charges (other than additional charges resulting from your choosing a different method of delivery from the cheapest standard delivery offered by us), immediately and no later than 14 days from the date we receive notice of your withdrawal of this agreement. For this refund we will use the same means of payment that you used for the original transaction, unless expressly agreed otherwise with you; in no event will you be charged for this refund. You must return or hand over the Goods to us immediately and in any case within 14 days of the day on which you notify us of the withdrawal of this contract at the latest. The deadline is met if you dispatch the Goods before the expiry of the 14-day deadline. We shall bear the costs of returning the Goods, unless the Goods cannot be returned by post due to their condition. Then you bear the direct costs of the return. 1. The warranty for defects of the purchased goods is governed by the statutory provisions, in particular §§ 434 ff. of the German Civil Code. BGB, as well as the following regulations. 2. Deviations in the quality, colour, size, equipment or design of the goods which are customary in trade or technically unavoidable and material-related are irrelevant. A right of withdrawal does not exist in the case of such or other insignificant defects. The customer is at liberty to prove that the deviations mentioned are significant for him. 3. The customer has no warranty rights if he has modified the goods and the defect was caused by this. Warranty claims due to improper use of the goods are also excluded. Claims of the customer for damages or reimbursement of futile expenses exist only in accordance with § 9 of these General Terms and Conditions. 1. MEISSEN is liable without limitation for intent and gross negligence. For simple negligence, MEISSEN is only liable in the event of injury to life, body, health or an essential contractual obligation. Essential contractual obligations are those whose fulfilment is necessary to achieve the objective of the contract and whose fulfilment the customer has trusted and may have trusted. 2. In the case of a slightly negligent violation of essential contractual obligations, the liability of MEISSEN is limited to the amount of the foreseeable, typically occurring damage. 3. The above limitations of liability also apply in favour of the legal representatives and vicarious agents of MEISSEN. 4. The liability according to the product liability law remains unaffected. 1. The law of the Federal Republic of Germany applies to contracts between MEISSEN® and the customer to the exclusion of the UN Convention on Contracts for the International Sale of Goods. 2. Should individual provisions of these GTC be or become invalid, the validity of the remaining provisions shall remain unaffected. Instead of the invalid provision, the relevant statutory provisions shall apply. This applies accordingly to the filling of any loopholes in these GTC.